The summer continued as a Seller’s Market while showing signs of some minor shifting. By Seller’s Market, I mean that it takes less than 4 months of currently available inventory, with no addition of inventory, to sell those homes. The Days to Sell and Average Sales Price numbers came directly from the MLS Listings results when I search a start date of July and an end date of August, in each of the two years. How does this shifting present itself? One way to tell is with a moderate speed of accepted offers from a year ago. When the number of days to sell increases, such as in Half Moon Bay and Moss Beach, buyers are taking more time to submit an offer, either due to more houses to choose from, or feeling that the asking price may not present the value they are looking for. Another way I notice a shift is in a lower average sale price, which occurred in Half Moon Bay. A lower average sales price shows a trend primarily. Individual houses may have sold for more than their asking price. The other three towns, El Granada, Moss Beach, and Montara, continued their average sales price increases for now. 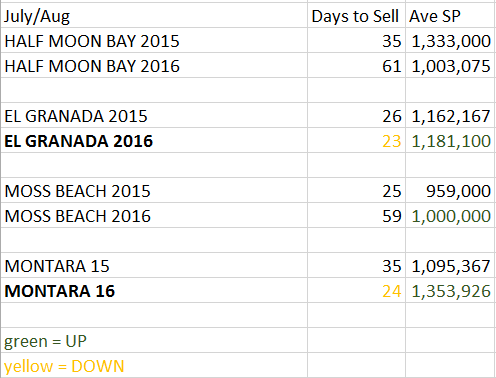 Half Moon Bay sellers need to know that this market is not the same as it was last summer (2015). The two hot spots this summer were El Granada and Montara. Both towns showed both a decrease on the number of days to sell and an increase in the average sales prices. However, Moss Beach showed a mix of higher sales prices and longer time on the market. The interesting note is that the two properties that sold during this time frame both sold for lower than the asking price. This makes sense when we look at the higher days on market (59). These differences are normal in a shifting market. As we enter the Fall 2016 Coastside real estate market, we expect plenty of activity while rates remain extremely low and inventory is slowly rising. Here is what is available in Half Moon Bay right now. Feel free to contact me for all available homes.